Scripps College Honors Ex-Rep. Giffords For Public Service : The Two-Way Former U.S. Rep. Gabrielle Giffords of Arizona was honored over the weekend for her service to the public by Scripps College. Her alma mater awarded her the school's highest level of recognition: the Ellen Browning Scripps Medal. 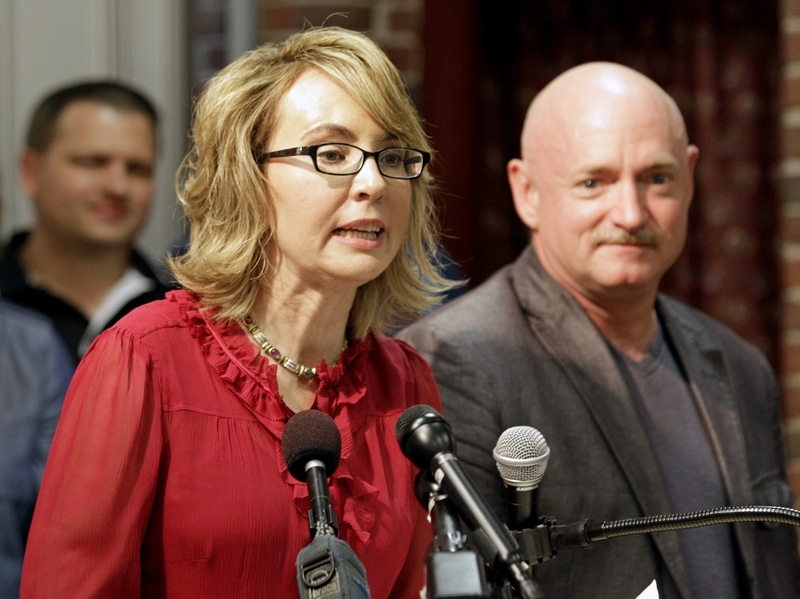 Former Arizona Rep. Gabrielle Giffords, accompanied by her husband, retired astronaut Mark Kelly, speaks during a news conference in Manchester, N.H., in July. They were there to encourage state political leaders to have courage in the fight to expand background checks on gun purchases. Former U.S. Representative Gabrielle Giffords of Arizona was honored over the weekend for her service to the public by Scripps College. Giffords' alma mater awarded her the school's highest level of recognition: the Ellen Browning Scripps Medal. The college says "her exceptional commitment to public service has strengthened " the country. Adding, Giffords is known nationwide for her consensus-building leadership in Congress, and resilience in the face of violence. In 2011, Giffords was shot in the head during a mass shooting in Tucson, Arizona. She resigned from Congress a year later. In 2013, she and her husband, former Astronaut Mark Kelly, formed Americans for Responsible Solutions. The organization encourages elected officials to stand up for solutions to prevent gun violence and protect responsible gun ownership. After the mass shooting last week at the Navy Yard in Washington, D.C., Giffords and Kelly issued a statement saying: "In times like this, it's the ultimate affirmation to have a nation behind you. And as proud members of the Navy family, we take note of the tragic fact that this terrible attack on men and women who dedicate themselves to keeping America safe did not occur in a war overseas, but in a mass shooting here at home." Giffords graduated from Scripps in 1993 and gave the commencement address in 2009, during which she talked about the importance of public service. Scripps College, in Claremont, Calif., was founded in 1926 by Ellen Browning Scripps and the award Giffords received has only been given out twice before. Former Supreme Court Justice Sandra Day O'Connor received the award in 1998. And in 1994, the college honored First Lady Hillary Rodham Clinton.